My college pal Amy and her husband are the proud parents of 2 month old TRIPLETS! After spending a month on hospital bed rest, Amy gave birth to the three little ones a little more than 12 weeks early! Now, at almost 2 months, Carson, Alex, and Avery are headed home VERY soon. Thanks to some very good MTW friends, these three will be going home in style. The Frog Pod gift set is fabulous! A big frog stores tons of bath toys and comes with these Bath Goods (Noel loves these bath toys the most!). The set also contains the Flo, which creates a fun cascade of water and prevents little ones from hitting their noggins on the water spigot. Is there anything better than a soft chenille blanket to cuddle up with? Bella Bubs has some of the highest quality products that I have ever laid eyes on-the craftsmanship is wonderful, and you can see the love that is put into these blankets. Wendy, the owner of Bella Bubs, also included some Runny Rags for little noses. Sarah May is the owner of this unique t-shirt company, in which she uses her knack for block printing to create these adorable t-shirts! 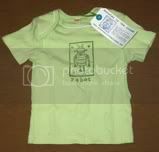 She has all sizes available, from infant to adult, and can even personalize the item, as you see here, on Carson's shirt. I'm glad to see that the triplets will spread the Monster love!!! You guys know that I am a swaddling addict, so I was a little jealous when I saw these muslin swaddle blankets that Kristina sent over from Aden & Anais. These will keep the triplets all bundled in this breathable, soft, cuddly fabric. Junger-Godfrey's final contribution to our baby shower is this set of awesome DVDs. We've been using these for a while now, and I can attest to the fact that these DO work. Noel can now recognize some words, and he's learning more all the time. The Your Baby Can Read series rules! Perhaps our friends will have three little geniuses on their hands thanks to this set!? My buddy Stephanie at Kindie Rock PR is involved with Putumayo World Music by day, and sent over these Putumayo Kids cds. Sorry, the picture isn't that great, but I've heard great things about these kids CDs. They're sure to be nice and relaxing to parents and kids alike. Ambajam sent over three of their Mini-Cuddles...some of the softest blankets I've ever laid hands on! We LOVE this blanket! It's so soothing, I often want to take it to bed! Baby Rock Apparel will outfit your little rockers in the hippest duds out there. Avery, Carson and Alex will be showing everyone who's boss with their shirts that say "Sorry Girls, I Only Date Models" and "Sorry Boys, I Only Date Rockstars". They came in this groovin' little lunch box too!! Tiny Revolutionary is committed to telling the world that as a parent, you're down with the current issues. The triplets will be showing that they'll change the world, celebrating individuality, and that all babies are created equal! Zutano really bowled me over with their care package! It included tons of outfits: wrap tops, onesies, leggings, and more in all of their great prints, along with 3 sleep sacks. They're sure to be the most hip babies in the NICU! No parent can resist the color and style of Hand Picked Pumpkin. These comfy clothes are sure to keep the babies cozy, cool, and ultra hip as they venture into the world! Of course, my Vincent didn't fail to send some totally irresistible little kicks for the Alex, Avery, and Carson...They'll be the hit of the town in their Minis and their Mini Frogs. I am sure they'll be Vincent fans for life after looking adorable in the coolest shoes around.